The IMF’s Chief Economist describes the complex forces that are shaping macroeconomic evolutions around the world and provides an overview of the state of the world economy. What has struck me the most as I was writing the foreword to the April World Economic Outlook is the complexity of the forces shaping macroeconomic evolutions around the world and the resulting difficulty of distilling a simple bottom line. Let me develop and expand. * Legacies of both the Global and the Eurozone crises are still visible in many countries. To varying degrees, high levels of debt—public, corporate, or household—still weigh on spending and growth. Nonperforming loans, in a number of European countries, are still weighing on banks, and limiting credit supply to new borrowers. Low growth, in turn, makes deleveraging a slow process. * Potential output growth has declined. As shown in Chapter 3, potential growth in advanced economies was already declining before the Crisis. Ageing, together with a slowdown in total productivity, have been at work. The Crisis made it worse, with the large decrease in investment leading to an even lower capital growth. As we exit from the Crisis, and as suggested by Chapter 4, capital growth will recover, but ageing and weak productivity growth will continue to weigh on growth. The effects are even more pronounced in emerging markets, where ageing, lower capital accumulation, and lower productivity growth are combining to significantly lower potential growth in the future. This is not just a worry about the future: More subdued prospects lead, in turn, to lower spending and a lower growth today. On top of these two underlying forces, the current scene is dominated by two factors that both have major distributional implications, namely, the decline in the price of oil and large exchange rate movements. * The sharp decline in the price of oil came as a surprise. Many explanations have been offered after the fact, the most convincing of which focus on the steady increase in supply from nonconventional sources combined with a change in strategy by OPEC (the Organisation of the Oil Exporting Countries). Most of these explanations suggest that the decline will likely be long lasting. The price declines have effected a large reallocation of real income from oil exporters to oil importers. The early evidence suggests that in oil importers from the US, to the Eurozone, to China, and to India, the increase in real income is increasing spending. Oil exporters have cut spending but to a smaller extent; many have substantial financial reserves and are in a position to reduce spending slowly. * Exchange rate movements have been unusually large. Among major currencies, the dollar has seen a major appreciation, and the euro and the yen a major depreciation. These movements clearly reflect major differences in monetary policy, with the US expecting to exit the zero lower bound this year, but with no such prospects for the Eurozone or Japan. Given that these differences have been clear for some time, the surprise here may be how long it took for these exchange rate movements to occur. To the extent that both the Eurozone and Japan were at risk of another relapse, the euro and yen depreciations will help. To some extent, the US has the policy room to offset the adverse effects of the dollar appreciation. Thus, this adjustment of exchange rates must be seen, on net, as good news for the world economy. Now, put these four forces together. Some countries suffer from legacies, others do not. Some countries suffer from lower potential growth, others do not. Some countries gain from the decrease in the price of oil, others lose. Some countries’ currencies move with the dollar, others move with the euro and the yen. Add to this a couple of idiosyncratic developments, such as the economic troubles in Russia, or the weakness of Brazil. It is no surprise that the assessment must be granular. On net, our baseline forecasts are that advanced countries will do better this year than last year, that emerging markets and low-income countries will slow down relative to last year, and that, as a result, global growth will be roughly the same as last year. But these aggregate numbers do not do justice to the diversity of underlying evolutions. Moving from the baseline to the risks, have they increased? I see macroeconomic risks as having slightly decreased. The major risk last year—namely, a recession in the Eurozone —has decreased, as has the risk of deflation. But financial and geopolitical risks have increased. Large movements in relative prices, whether exchange rates or the price of oil, create losers and winners. Energy companies and oil-producing countries face both tougher conditions and higher risks. So do non-US companies and governments that have borrowed in dollars. If large exchange rate movements were to continue, they could both create further financial risks and reignite talk of currency wars. A Greek crisis cannot be ruled out, an event that would surely unsettle financial markets. Turmoil continues in Ukraine and in the Middle East, although so far without systemic economic implications. Finally, given the diversity of situations, it is obvious that policy advice must be country-specific. Even so, some general principles continue to hold. Measures to sustain growth both in the short and the longer term continue to be of the essence. With the introduction of quantitative easing in the Eurozone, monetary policy in advanced economies has largely accomplished what it can. Fiscal room exists in some countries but is limited; the decrease in the price of oil has created an opportunity to decrease energy subsidies and replace them with better-targeted programmes. The case for more infrastructure investment we made in the previous World Economic Outlook remains. And while structural reforms cannot do miracles, they can increase the level of output and increase growth for some time. The proper menu differs by country. Given the short-term political costs associated with many of these reforms, the challenge will be to choose carefully among them. IMF (2015), World Economic Outlook: Uneven Growth – Short- and Long-Term Factors, Washington, DC, April. 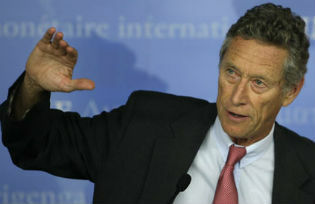 Olivier Blanchard is the IMF’s Chief Economist (Economic Counsellor and Director, Research Department) and Robert Solow Professor of Economics Emeritus at MIT. His research interests are in macroeconomics, including a wide set of issues that range from the role of monetary policy to the nature of speculative bubbles, to the nature of the labour market and the determinants of unemployment, to transition in former communist countries, to the global financial crisis. He is the author of many books and articles, including two textbooks in macroeconomics, one at the graduate level with Stanley Fischer and one at the undergraduate level. He is a fellow and past council member of the Econometric Society, a past vice president of the American Economic Association, and a member of the American Academy of Sciences. He obtained his PhD in Economics from MIT in 1977.